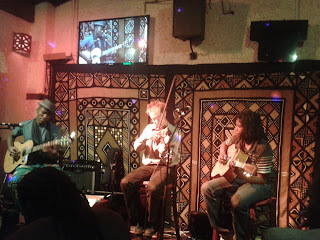 One of the worries I had when I left Paris to come to Nairobi, was that the musical scene in Nairobi might not be as vibrant as that of the French capital. I am very happy to have been proved wrong. This past week has been a musical marathon, the more delightful as I was just enjoying it as a spectator. Last Sunday the Nairobi Orchestra gave a concert celebrating 50 years of independence. It featured a Wagner opera overture, the first movement of an intricate Mozart Sinfonia, and the world première of an uplifting piece by Kenyan composer Njane Mugambi depicting the parallel ordeals of building the Mombasa-Uganda railway on one hand and the Kenyan nation on the other. The highlight of the show for me was Beethoven's 5th Symphony. Given that the orchestra is composed of mainly amateur musicians, and that some instrumental sections are rather depleted for lack of available players in Kenya, they gave a fine rendition of the famous work. Tuesday evening Christian and Claire Turner invited me along with other of their musical friends to their residence for a private recital by British pianist Anthony Peebles. It was a delightful evening of romantic piano music: Brahms, Schumann, Liszt, Chopin. The Turners' cook had also prepared finger food so our stomachs would not rumble while our ears enjoyed the music. On Wednesday I spent the evening searching for music for the next concert of the Greenwood Singers. We are still discussing what we will be singing but a consensus seems to emerge that this group is not just about rehearsing good music; we also want to keep inviting each other to dinner on rehearsal evenings and keep having fun. All that is fine with me and I really look forward to September when we start singing again after the Nairobi winter break. Thursday was adventure night as I ventured out and got lost in the Industrial Area of town. I was looking for Choices Pub and Restaurant where Thursday night is live music night: live jazz, blues, rock, soul every week. When I finally found the bar, I discovered a medium-sized room with lots of snug corners for groups of friends to sit in, a large selection of drinks, and a centre stage for the band. 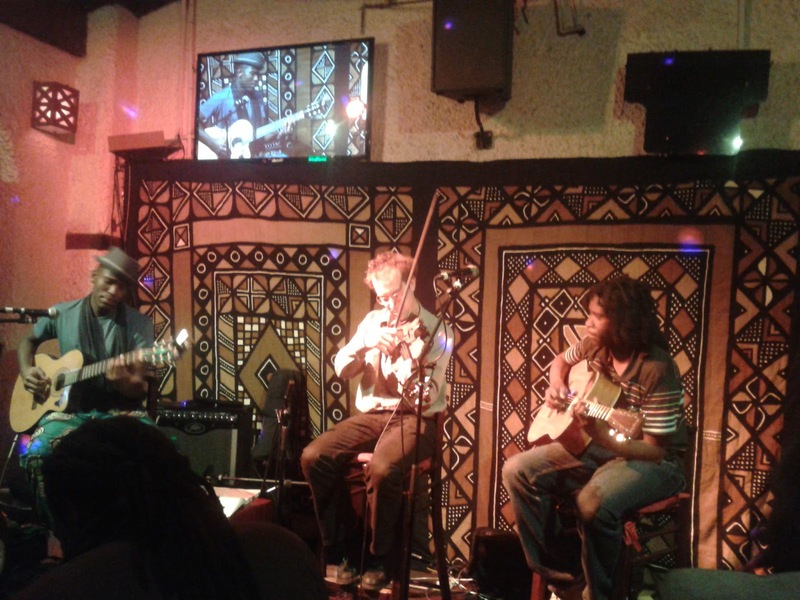 This Thursday featured the acoustic string trio Kabon who delighted the audience with their folk-blues interpretations of Western and African standards. Finally, Friday evening - day of the Fête de la musique in France and in many countries all over the world - I went to a fund raising concert of the National Youth Orchestra of Kenya. This was a black-tie-and-evening-dress event where everything we ate and drank was charged. The small audience got to see these young promising players perform some very challenging pieces. We saw that they could also improvize and dance while playing African rythms and harmony. We got to mingle with the musicians during the dinner interval so as to learn more about the challenges of training young Kenyan musicians to classical music and how the National Youth Orchestra of Kenya is striving to reach that goal. All the proceeds of the evening will go to the orchestra so as to buy instruments for these young musicians and pay for the travel of trainers coming from abroad to teach Kenyans how to play some of the rare instruments that actually have no local teachers in the country. The next public concert of the National Youth Orchestra of Kenya is on Sunday 14 July at Strathmore Business School in Nairobi. I think it is really worth while to go support these promising young musicians.